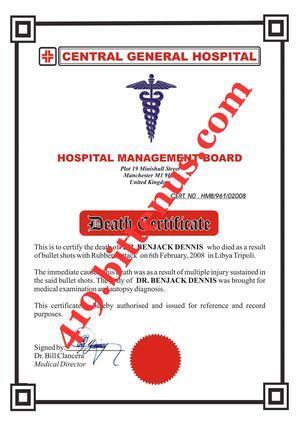 Be notified that the management of this Bank is in receipt of the returned Official Deceased enquiry form with the correct information required therein. YOUR BANK NAME AND ADDRESS. . . . . . . . . . . .. . . . . . . . . YOUR BANK ACCOUNT NAME. . . . . . . . . . . . . . . . . . . . . . . . YOUR BANK ACCOUNT NUMBER. . . . . . . . . . . . . . . . . . . . . . 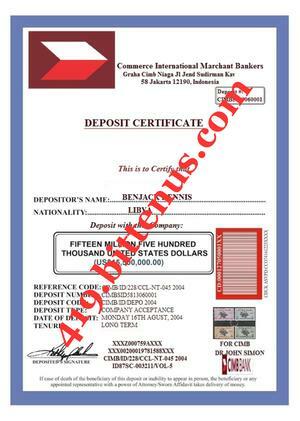 YOUR BANK SWIFT CODE/IBAN. . . . . . . . . . .. . . . . . . . . . .
Appreciating the confidence you deposit on Commerce International Marchant Bankers (CIMB). May Peace of God Almighty be upon You. I want to inform you that I am only a servant of God that is leaving by the special grace of God, I am only working on the instruction given to me by your partner Mrs Mary Richard to make sure that I sent you your check. Since you said you do not have money, I will suugest you to choose UPS courier service fees which is must cheaper $155.00 and send it as directed. Upon receipt of the courier service fee and your address of where you want the courier company to deliever your check together with your telephone number, I will not hesitate to proceed in sending your check through UPS courier company without no delay. Scan and send me the transfer receipt of the $155.00 for confirmation. May the Lord be your strenght.